With Super Bowl XLVIII set to take place at MetLife Stadium, there's a very realistic chance, in addition to Sunday's game, the New Orleans Saints could make a return trip to the area in February. The Saints are a wild last-second loss away from being undefeated and a legitimate title contender. The Jets will have their work cut out for them going up against one of the best offenses in the league. New Orleans possesses such a prolific offense that, despite playing one less game than the Jets, the Saints have still outscored them by a total of 53 points. Tight end Jimmy Graham's health could be the key to the Saints' success this week as he was limited in practice Thursday while dealing with a torn plantar fascia in his foot. A former basketball player, Graham has the size of a power forward to go along with the athleticism of a wide receiver. If he's at full strength, the Jets can expect a similar attack to the one they faced a couple weeks ago when the New England Patriots repeatedly looked in Rob Gronkowski's direction. Gronkowski was targeted 17 times that day, finishing with eight receptions for 114 yards. Graham saw just 18 snaps last week but Drew Brees is able to average 327 passing yards per game because he spreads the ball around to multiple recipients. Brees is not afraid to throw to running backs Darren Sproles and Pierre Thomas, allowing them to do their thing in open space. Rookie receiver Kenny Stills is coming off the best game of his career but lacks the type of speed that has hurt the Jets most of the season. Former Hofstra product Marques Colston isn't the player he once was but can't be ignored as he still makes for a pretty good fourth or fifth option. It will be interesting to see how the Jets handle the different dynamic that New Orleans will throw at them. There's a good chance corner Antonio Cromartie sees some time covering Graham and they'll need the linebackers to be on their toes because every eligible receiver is a possible threat. Gang Green must do a better job of getting pressure on the quarterback than they did last week against the Cincinnati Bengals. If Brees has the same time in the pocket that Andy Dalton did, the Jets are going to be in for a long afternoon. Four time All-Pro guard Jahri Evans might not play for the Saints due to a hip injury which could open up a hole for the defensive line and allow them to get some hits in. With the game occurring just a few days after Halloween, the Jets are hoping Geno Smith will don his best Brees costume and play more like the 13-year veteran rather than an inconsistent rookie. Smith will have his hands full with the scheme of Saints defensive coordinator Rob Ryan, fraternal twin brother of Jets head coach Rex Ryan. The Saints average a little over three sacks per game so Smith needs to be alert with the oncoming pass rush. He's been guilty of holding onto the ball too long and must have a greater awareness of his surroundings. The Jets never got their running game going against the Bengals and it forced them to rely on Smith way too heavily. New Orleans doesn't have very many weaknesses but they can be beaten on the ground. The team allows a league-high 4.8 yards per carry, which means Bilal Powell and ex-Saint Chris Ivory could expect to see the ball in their hands quite a bit. 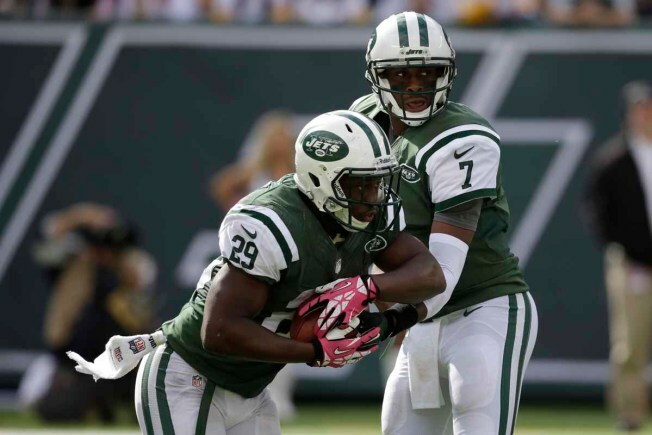 The more touches Powell and Ivory get, the better the chance the Jets will have of keeping it close. Establishing the run becomes all the more important as the Jets are down to their last two options at tight end, Zach Sudfeld and Konrad Reuland. Jeff Cumberland is expected to miss Sunday's game with a concussion while Kellen Winslow will sit out the fourth and final game of his suspension. Sudfeld and Reuland have combined for just three catches this season in limited action. Based on how the first eight games have went, the Jets have at least shown they're capable of putting bad losses behind them. They'll need that resiliency on Sunday because, following an embarrassing defeat, the last thing the Jets want to do is get blown out for a second straight game heading into the bye week. In order to make sure that doesn't happen, they need to run the football. If the Jets are able to run the ball well and eat up the clock with long drives, it will keep Brees and company off the field while chipping away at an area where the Saints struggle. A good rushing attack will also open up additional options for Smith and lessen his workload. Given their inconsistent ways, nobody knows which Jets team will show up Sunday. In the event that the same team that ran the ball 52 times in an upset victory of the Patriots makes an appearance, they could have a chance of making things very interesting against the Saints.